I’m always amazed by the naive notion of many Islamophobes who are sure that Muslim radicals are the most dangerous, unethical, religious fanatics on Earth -not realizing that such misuse and abuse of religious teachings can be found in almost every religious community. Here is an example of a “Rabbi” who believes that Judaism justifies the destruction and murder of the Gaza Strip and its inhabitants. Rabbi Dov Lior, a national- religious leader and the chief rabbi of Kiryat Arba and Hebron, published a letter on Monday saying that Jewish law permits destroying the entire Gaza Strip to bring peace to the south of the country. Meretz chairwoman Zehava Gal-On condemned Lior’s comments and called on the attorney- general to open an investigation against him for incitement. 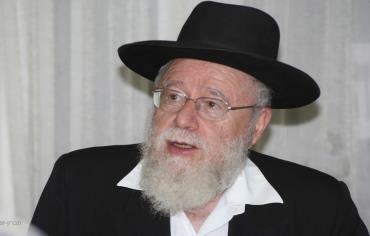 “Rabbi Dov Lior’s racist comments have for some time not been in the realm freedom of speech. We’re talking about a man who praises mass murder, who stands behind those who murder innocents and who took part in the incitement that led to the murder of a prime minister,” Gal-On said in reference to prime minister Yitzhak Rabin, who was assassinated in 1995. “These type of comments aren’t made in an empty space, but constitute an inseparable part of the dangerous and tempestuous atmosphere prevailing in Israeli society in recent weeks,” she said. “There is therefore a real concern that these comments will become a genuine threat to the lives of more innocent people. Lior once wrote an approbation for a book called The King’s Torah that was co-written in 2009 by radical settler figure Rabbi Yitzhak Shapira, which permitted killing civilian non- Jews in times of war. Previous Previous post: The Next Time Someone Tells You Israel is a Racist/Apartheid State….